Hello, I have this phone for almost 1,5 years. For a second time I have problem with the speaker. Nobody can listen loud and clear when I call. First time they change the hardware with the speaker. I don't know what to do now. Do you have any idea? Anonymous, 18 Feb 2012is watersupposed to go through the first ccover? Bought an active yesterday and water went ins... moreI have the same problem!! Is this suposed to happen??? And i have another trouble too... when I take photos underwater, the loudspeaker gets wet and i dont know of this is ok!! Please help me!! PLEASEEE!!! helo. my xperia actives camera is not clear as others. I found that it is because of the waterproof cover's cameras glas is not clear. I cleand it but juz a lil bit of change. please help. any suggestions???? 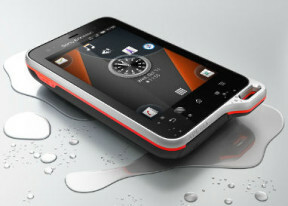 I love this phone,rugged,stylish and comfortable to use.. Please tell me is xperia active has screen guard originally?when I bought and take it out I saw something like screen guard I is that true? An alternative to the Walkmate application mentioned is Activity Classifier which records the activity being undertaken and the energy being expended. It publishes the data live in Google Fusion Tables. waterdog, 21 Nov 2011Bought this phone just 2 weeks ago,and overall its great,the OS is fast similar to iphone's OS... moreHi! I know you this phone! This can take picture under water or record video underwater? XpActive_fan, 27 Nov 2011Had this baby for 1 day and I kept getting the "software update" prompt. Big mistake... morejust use seus and everything will be fine!!! Had this baby for 1 day and I kept getting the "software update" prompt. Big mistake. The update failed now I'm left with a brick. I hope this unit gets replaced coz I really fell in love at first sight and I chose this over LG's Optimus Black. Bought this phone just 2 weeks ago,and overall its great,the OS is fast similar to iphone's OS. The pictures are great and resolution is solid. Its pocket friendly and does not weight that much. I haven't tried using it in the water thought. But i think would perform great. Best Outdoor phone for me, it has balance on all features and still looks sleak. in my area signal strength is low. AnonD-28487, 04 Nov 2011Have since last 2 weeks...Super phone with super looks and super performance.... must have....how's the battery life then? might buy this phone next month. is the battery life ok?